Based on just its basic superhero premise, CBS’ Supergirl is definitely not lacking in the powerful characters department, but the show just keeps adding them anyway. At least now we have another human being to add to the mix, rather than a supervillain, as 24 actor Glenn Morshower has been brought in to take charge as General Sam Lane, perhaps the second most well-known father in the Superman mythos. As Sam Lane, Morshower will play a father to Lucy Lane and sister Lois, the latter of whom won’t be a character in Supergirl. His first appearance in the show will come after Lucy, played by Jenna Dewan-Tatum, is introduced. According to TheWrap, this version of Sam Lane will be a rugged military man whose goals include protecting the everliving hell out of his two daughters, to the point of being overbearing. But while his family life might be all about love and security, his life in National City will be a tad more complicated, especially when it comes to Melissa Benoist’s Kara Zor-El, better known as Supergirl. He alters her life path by attempting to bring her in to a dangerous government initiative, though it’s not clear what that might entail. I’m guessing it’ll involve taking down bad guys. Or the good guys, even, depending on where his morals lie. First introduced in the late 1950s, the comic version of Sam Lane was initially a simple horse farm, but was later turned into a bullheaded Army general who treated his daughter Lois like the son he never had. He sided with Lex Luthor on occasion in trying to bring down Superman, whom he sees as a threat to Earth. If this is how he’s portrayed in Supergirl, I’m pretty sure Kara won’t like hearing him say foul things about her cousin. 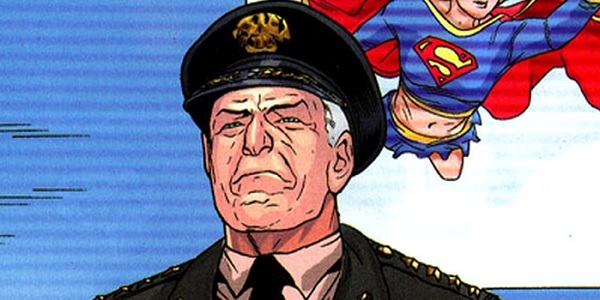 The character previously appeared on Smallville, with Michael Ironside in the role, as well as on Lois and Clark and Superman: The Animated Series. A character actor who has appeared in nearly every show imaginable, from CSI to The Secret World of Alex Mack, Morshower became a regular character on 24 as the President’s bodyguard Aaron Pierce, one of TV’s most loyal characters. Often playing military men in things, he also had notable roles on Friday Night Lights, Dallas and most recently on Netflix’s Bloodline. On the film side, he was last seen in Dark Places and is currently filming Jon Cassar’s horror thriller When the Bough Breaks. Supergirl will fly across your TV screen when it premieres on CBS on Monday, October 26.